[youtube https://www.youtube.com/watch?v=JnfBXjWm7hc] I was just talking about this video and sentiment the other day, in the context of my personal wellness journey. While I'm not quite where I want to be (I need to get a more consistent workout routine), I'm much better than I was a few years ago, mostly with better eating habits. 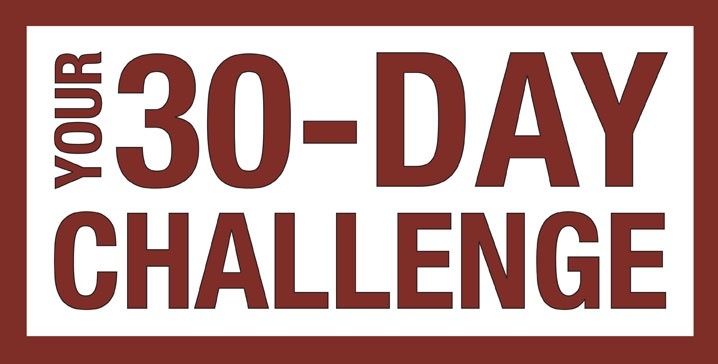 A major way I changed some of my bad habits was by undertaking several "30-Day Challenges", which are detailed in the short, engaging, fun video above. Whether you want to start going to the gym or stop drinking soda, write every day or stay off social media, doing something for 30 days is just about the right time to form a habit and pattern in your life. At the very least you'll sort of do a cleanse if you don't imbibe in junk food for a month, for example, and you can sort of ween yourself back in so you don't feel like you're depriving yourself. "The next thirty days are going to pass, whether you like it or not. So why not think about something you have always wanted to try, and give it a shot, for the next thirty days."